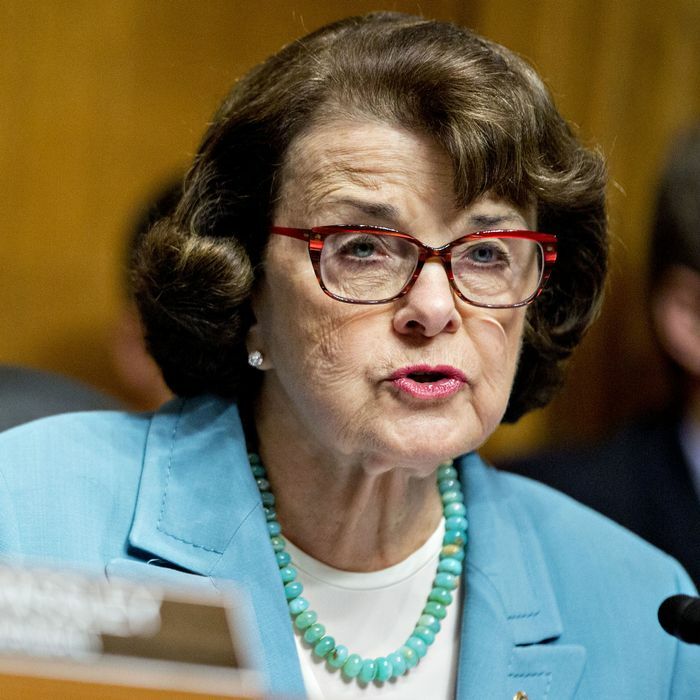 Dianne Feinstein sat alongside other senators at a hearing on Wednesday and questioned two federal appellate-court nominees. She was particularly anxious about Amy Coney Barrett, a law professor at Notre Dame: Feinstein was not convinced that Barrett would uphold Roe v. Wade given her traditional Catholic beliefs. In Lipsky’s telling, this became “an obnoxious grilling” from “Democrats” about Barrett’s faith, violating the specific prohibition in the Constitution of any “religious test” for holding public office. Now first of all, Dianne Feinstein is not the embodiment of the “Democratic Party.” If she was, then her own state party would probably be endorsing her reelection instead of flirting with an endorsement of her intraparty opponent Kevin de Leon. It’s part of a sloppy habit Republicans have of identifying some controversial outlier in the Donkey Party ranks and making her or him the Universal Donkey (Democrats don’t have to do that much, since nine times out of ten the most outlandish GOP remarks come from the party leader in the White House). To be clear, I’m familiar with the issue and agreed with those who applied it to the questioning of another Trump appointee, OMB Deputy Director Russell Vought, by Senators Bernie Sanders and Chris Van Hollen last year. Vought had publicly expressed the conservative Christian conviction that eternal life is obtained exclusively through Jesus Christ, though he also insisted that his religion demanded respect for people from all or no faiths. Sanders and Van Hollen had big issues with Vought’s views, but never explained why they were germane to his performance of the very earthly duties at OMB. So they shouldn’t have gone there. Feinstein, by contrast, was trying to figure out where Barrett stood on the highly germane issue of a constitutional right to an abortion. In Barrett’s case, since she had written about moral conflicts facing Catholic judges, the question was whether she would prejudge the entire subject on religious grounds. The garbled line about “the dogma” was unfortunate, but it’s not like Feinstein is some sort of anti-Catholic bigot; she did, after all, vote to confirm Catholic Sonia Sotomayor for SCOTUS, and although I don’t have her full judicial voting record on hand, I’m sure she’s voted for a host of Catholics for lower-court positions over the years. And so Lipsky’s comparison of Feinstein (or actually, “Democrats”) to a conservative who objected to Muslim Represenative Keith Ellison being sworn into Congress on a Koran is not logical at all. The latter was a real, unambiguous “religious test” for sure. The irony of this line of argument in defense of Barrett is that much of her support appears to be from Christian conservatives who think her religion will in fact make her the likeliest prospect to strike down Roe v. Wade. They are imposing their own “religious test” on SCOTUS, and while you can’t blame Barrett for that, it should inhibit her fans from claiming that a desire to defend the 45-year-old precedent of a constitutional right to choose represents discrimination against Christians. Last time I checked, Anthony Kennedy, the pro-choice justice whose retirement the anti-abortion lobby is cheering to high heaven, is a Catholic, too. And those who argue that a “good” Catholic in the judiciary can’t be pro-choice are really imposing a religious test on public office, and ought to cut it out.